How do you make the Brompton even better? Improve the gearing so that it is easier to use, offers a wider range, and has steps that aren't so big. Enter Ben Cooper and the Shimano Alfine 11-speed hub. Ben designed a custom rear triangle for the Brompton that works with any standard 135mm OLD hub and accommodates a disc brake if you like. The rear triangle is custom painted to match you bike, in this case it was black, to match the existing rear triangle on the Special Edition Nickel I was mounting it on. For this build, I chose the Shimano Alfine 11-speed hub since I felt the Rohloff was overkill both in terms of cost and gearing. The Alfine 11 is a relative newcomer to the world of internally geared hubs although Shimano has been producing IGH's for many years. The Alfine 11-speed is the crown jewel for Shimano and fills a big gap in the market between the Nexus 7/8-speed hubs and the uber expensive, German-made Rohloff 14-speed hubs. I purchased a complete conversion kit which included new rear triangle powder coated to match, custom chain tensioner, complete rear wheel (rim, spokes, Alfine 11-speed hub), shifter and mounting hardware. You will need to reuse your rim strip, tube and tire, as well as the special bolts that attach the rear triangle to the frame. The conversion process is straightforward - remove the existing stock rear triangle by first removing everything attached to it, attach the new Kinetics rear triangle to the main frame, reattach everything removed from the stock rear triangle to the new Kinetics rear triangle, mount the new rear wheel with Alfine hub to the rear triangle using the supplied chain tensioner, route the shifter cable using the rear brake cable as a guide, and finally, add a few links to your chain and you are done. The most difficult part of the process was getting the stock rear triangle off the bike. 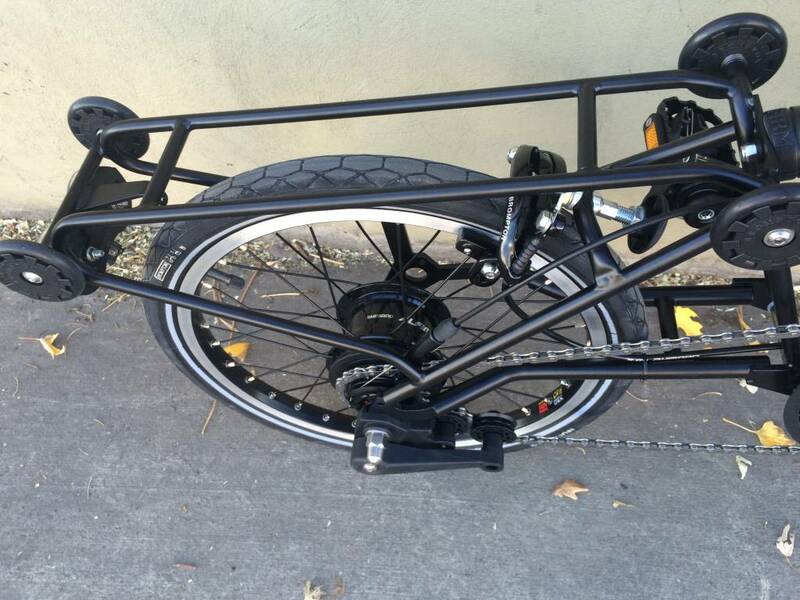 There are two countersunk screws that pass through the rear triangle and into the rear hinge rod. Those screws are set with thread locking compound and once you release one side the other side just spins freely with the rod. I made a special locking tool to hold the hinge rod tight while I loosened the remaining screw. The thread spec for the screw is 1/4" x 28 tpi, so I bought a 1 1/2" bolt with that thread spec, ran a nut halfway up the bolt, slid two washers on the bolt then screwed the bolt into the hinge rod up to the nut. I then held the bolt with a wrench and tightened the bolt with the washers against the rear triangle. Once tight, I was able to loosen the remaining countersunk screw. I then removed the holding tool and the rear triangle was free. From experience I know that some rear triangle are really difficult to remove and may require drilling out the heads of the countersunk screws. In that case, you will need new screws when reassembling. With a 408% ratio spread the hub offers plenty of gearing options for most users. The highest 10 gears are all about 14% apart, while the first two gears are closer to 30%. Shifting is accomplished by Shimano's well designed, under bar trigger shifter. Like the Rohloff, the Alfine-11 is oil lubricated and has an oil port allowing you to change the oil periodically, a task that isn't difficult.